The Grundfos Hydro MPC E CR booster systems are made to the very highest standards. Thanks to the CU 352 controller, they handle even the most difficult boosting jobs with ease and accuracy. 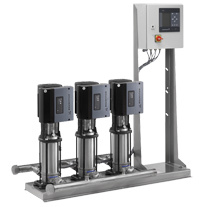 The intelligent cascade control ensures that the optimum number of pumps required to meet the demand runs at any time. Together with CR pumps, the E motors make the Hydro MPC the most energy-efficient solution for maintaining a constant pressure during changing flow demands. � �Menus in plain text.